Early today, Eurodiaconia released a collection of its members’ projects titled “User involvement as pathway to social inclusion”. The publication aims at providing some concrete examples of projects which are successfully using user involvement to empower vulnerable users and lead them towards social inclusion and independent lives. The mapping is focused on projects run by 7 Eurodiaconia members in 6 European countries, directed towards people experiencing poverty and social exclusion, such as long-term unemployed or homeless people. With this publication, Eurodiaconia aims to inspire other organisations within and outside its network to develop innovative ways of involving their users and develop their participation and ownership of the projects. Furthermore, our network also wishes to draw the attention of policymakers and authorities to the importance of user involvement for social inclusion projects and those projects need for support. As a network of diaconal social service provid­ers, Eurodiaconia and its members have been working on user participation, involvement, and empowerment throughout the last years. Many social service users are experiencing some forms of vulnerability, facing individual or social barriers to leading an independent life and playing an active role in society. User involvement has therefore proven to be key to the provision of quality social services that can empower users and restore their dignity. 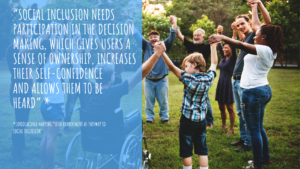 In 2015, Eurodiaconia has published a toolkit on user participation and empowerment, which outlines key principles and conditions for suc­cessful user participation in social services. Eurodiaconia will continue its advocacy work in the area of extreme destitution at European level, for example in the frameworks of the European Pillar of Social Rights and the negotiations around the European Social Fund Plus (ESF+), together with its members and partner organisations. Furthermore, the network will continuously exchange and promote its good practices and discuss issues such as the meaning of social inclusion from a diaconal perspective. To know more about our members’ projects on social inclusion, check our latest mapping.